Note: This blog post was written by Craig White and LB Brier of the Campaign for Southern Equality and Adrian Parra and Becky Baylor of Youth OUTright WNC following the first-of-its-kind Western NC GSA Summit. You can make a donation in honor of the Summit by clicking here. This was an awesome experience! I learned a lot and had a great time. 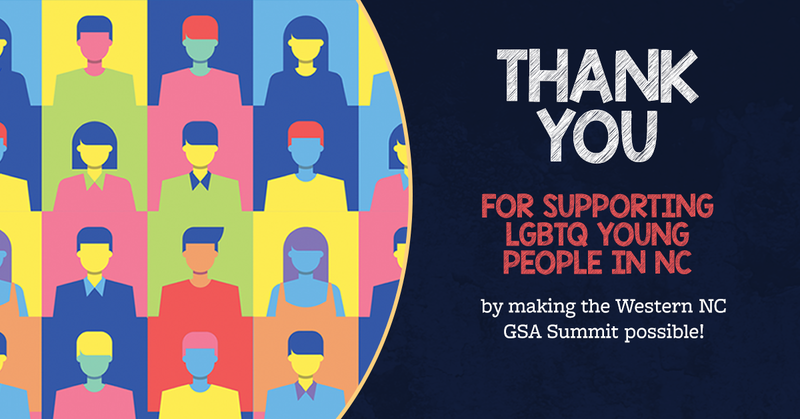 This is what participants told us after the first Western North Carolina GSA Summit. More than a hundred students, faculty and supportive adults, from eight Appalachian counties, came together for discussions and workshops on everything from self-care to strengthening youth leadership to advocating for policy change at school. Watching the students share their stories, articulate their vision, and advocate for themselves was very inspiring. It was an honor to witness and be a part of such a large and diverse group of individuals, who gathered to support one another in a safe space. And we couldn’t have done it without you! All of us at the Campaign for Southern Equality and Youth OUTright WNC appreciate you so much–the donations you made, the volunteer hours you contributed, the encouragement you offered. We particularly want to recognize all the sponsors who helped us pull it together: Equality NC, Asheville YMCA, Blue Ridge Pride, The Southern Equality Fund, PFLAG Asheville, PFLAG Hendersonville, SAGA at WCU, Asheville Gay Men’s Chorus, Home Me Tight, Open Hearts, Unitarian Universalist Congregation of Asheville, Vortex Doughnuts, Bruegger’s Bagels, and Manicomio Pizza & Food! I learned so much from the session on Advocating for Inclusive School Policies. I’m fairly new to the advocacy side of being an Ally (as an educator) so anything I can do to reach best policy for my students is appreciated. We learned so much at this event, and we’re excited to put it into use at our GSA. Thank you so much! The Summit is over, but the work goes on. Youth OUTright is reaching out to visit GSAs across the region, and helping start new clubs in schools that don’t have one now. We’re also organizing an affirming and inclusive YO Prom in June. Email info@youthoutright.org to learn more, follow us on Facebook and Instagram or find us at www.youthoutright.org. At CSE, those of us in the Supportive Schools Program are providing workshops for educators, supporting advocacy for inclusive school policies, offering microgrants for GSA projects through the Southern Equality Fund, and advocating for laws that will protect LGBTQ youth, such as Born Perfect NC. Email craig@southernequality.org to learn more. I realized that whatever our struggles in school may be, someone has our back. Thank you for supporting our organizations, as we work together to support young people in the South.